Watermarx Graphics have kicked off 2016 with the Midas touch! We worked with designer, Andy Medhurst from Cox Architecture Sydney, to help him create this gorgeous launch party invitation. We asked Andy to share the story with you for some new year design inspiration. Plus, we have a hunch that gold attracts gold and this won’t be the last we hear of this award-worthy piece! 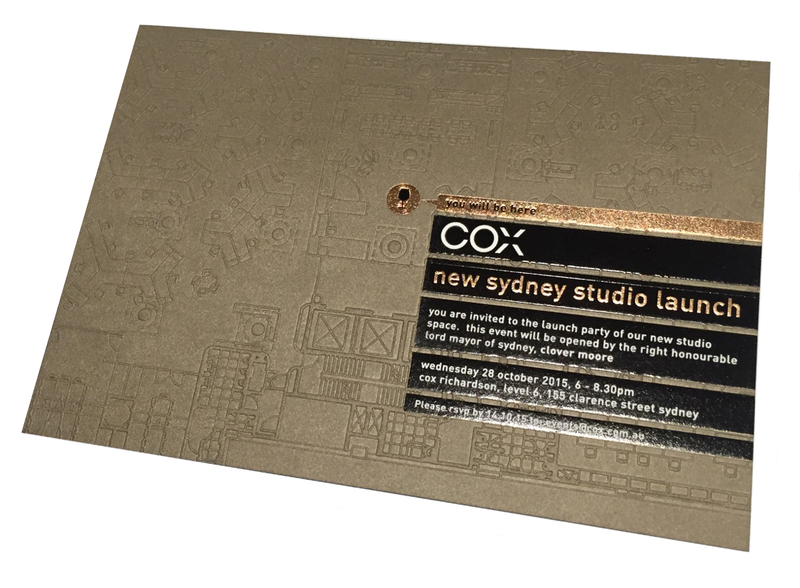 Andy Medhurst: This invitation was for the launch of the new studio office space for Cox Architecture. 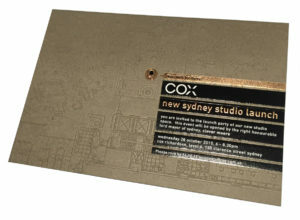 As Head of Graphics for Cox Architecture Sydney it was my responsibility to create this design. The three of us in the graphics team – Catalina, Josh and myself – sat down to brainstorm ideas for this piece. Our starting point was, of course, architecture. The invitation needed to reflect that first. This combined with my background in wayfinding design, where I spend many, many (did I say many?) hours studying plans and elevations. This led to the “You will be here” idea. By strategically laying out the office floor-plan, I was able to create a ‘You are here’ indicator with the wine glass pictogram, pinpointing the location where the launch party gathering would occur. Pictograms feature heavily in my design work these days, as they are such a strong and direct visual forms of communication. Did you try anything you hadn’t done before when creating this piece? AM: Yes. I have actually never designed for letterpress before. I had created embosses and foils using offset printing methods but I have always be keen to explore letterpress. The paper and embellishments in this instance were crucial to the success of this invite. The floor plans which cover the entire invite were blind embossed into the paper stock so it was important they read as plan drawings, otherwise the essence of the invite would have been lost. I feel that this effect allows the recipient to be more engaged with the piece. I love texture in print, and this way, those who received an invitation were able to touch the plans in 3D emboss under the fingertips. I was nervous about how well some of the key lines of the plans would emboss into such a thick card stock. Watermark completely surprised me when I saw the proof. They exceeded my expectations with the best emboss effect I have ever seen on such a thick paper stock. Did Watermarx have any suggestions that shaped the development of the design? AM: Watermarx were fantastic. They advised which stocks would work best to achieve the desired result – of which I was never truly convinced until I saw the proof. I should never have doubted! For the text elements I wanted to use foiling, using both black and gold. I wanted to use a metallic ink as I love the way metallic reacts and soaks in flat with that stock. We covered the entire invite using a PMS metallic gold that I knew would soak in to the matte stock, with their advice, giving a matte lustre effect. Once again, I was a little nervous how the gold on gold would go, but the end result was very satisfying. The foiled elements then really jumped off the matte metallic surface. What was the feedback for the invitation? AM: It was very well received by all. I had many positive comments from workmates and even great feedback from those who received it in the mail. This was a design that you could only see after the entire job had been printed. It had such a nice tactile quality with the blind emboss that always allows the recipient to become more engaged with the piece. How did you find the process of working with Watermarx? AM: They were extremely helpful even under the very tight deadlines I had to produce this design. Extremely friendly and helpful when talking through the processes I needed to supply artwork for this design process. It was fantastic to do the site visit and see how the plates work on those beautiful original letterpress printing machines. I definitely have some good ideas for the next time I get to delve into letterpress printing.